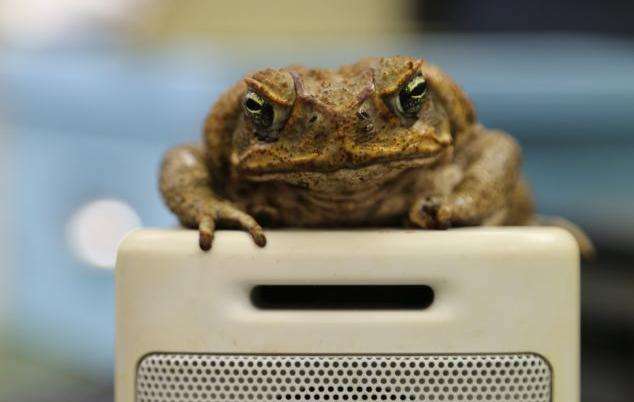 Cane toad on a speaker. Credit: Alistair Bone, JCU Media. JCU's Benjamin Muller said the active calling space of cane toads is remarkably large. "This means they are heard by more individuals and can bring in more mates to breed with than some other species," he said. The JCU team found that male cane toads respond to mating calls up to 120 metres from the source. Most other frog and toad species do not respond beyond a few metres. "Also surprising was the fact that male toads respond strongly, and from far away, to mating calls from other males - probably because they signal the presence of water and, eventually, the presence of females they can mate with." But Mr Muller said female cane toads are more picky. "Female cane toads become uninterested more than 70 metres from the source of the mating call. Probably because they need to hear complex information in the call, such as the size, energy levels and health of potential mates, and from far away, those details are difficult to discern." The team is carrying out the study to try to eradicate the invasive pest. Mr Muller said the latest research will mean more effective use of audio-based traps that use recorded mating calls as a lure. "Now we know from how far we can attract the toads we can space the traps for maximum effect. It will mean a more efficient set-up and less wasted effort."